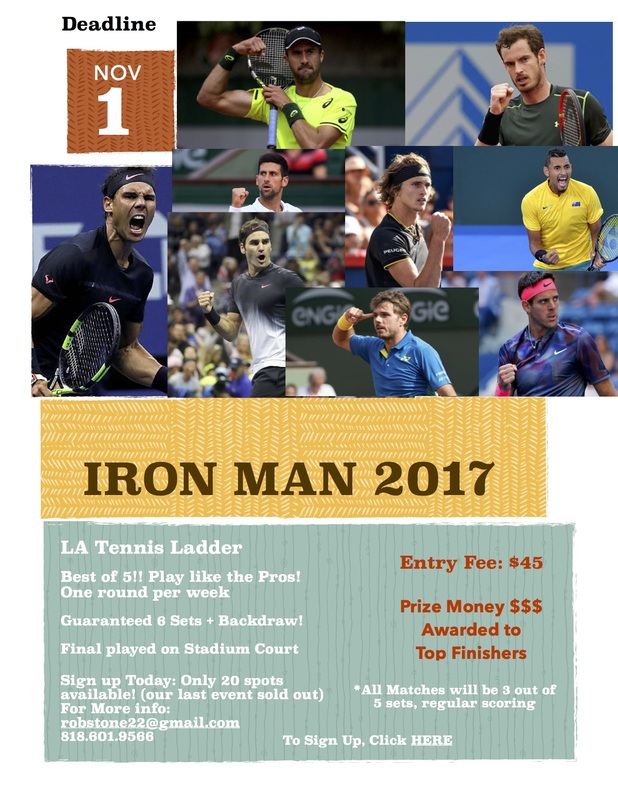 Who’s Eligible: The tournament is open to anyone.You DO NOT have to be a member of the LA Tennis Ladder to play in the tournament. Prizes: This is a MONEY tournament (amount to be determined based on number of entries. Our last tournament was $200 for champion). Where: Matches can be played at any mutually agreed upon location between the players. Final to be played on a stadium court (recent finals were played at Calabasas Tennis Center and Burbank Tennis Center). Format: Singles: Best three out of five sets with regular scoring. Ladder Rules apply. Deadline: Entries must be received by 11.1.17. Note: By signing up for the tournament, player releases The LA Tennis Ladder, Vienna Productions, and any of the officers, servants, agents and employees of the above mentioned entities (RELEASEES) for any liability, claim and/or cause of action arising out of or related to any loss, damage or injury, including death, that occurs as a result of their participation in the above described activities.